This is a short blog post about my thoughts on using Go in anger through several workplaces, as a developer and an advocate. Back when Go was first announced we used Makefiles to compile Go code. These Makefiles referenced some shared logic stored in the Go distribution. This is where $GOROOT comes from. Back then, if you wrote Go code, you’d probably also used these Makefiles, and while you could check out your source code anywhere, most people would put their own Go code in what today we’d call $GOROOT/src as you must’ve compiled Go from source, so this directory was always going to be present. Towards the 1.0 release goinstall, then go get, solidified the use of domain names in import paths to provide a globally unique namespace. These tools introduced a new location into which Go code would be fetched. This location was separate from $GOROOT to make clear the distinction between code provided by the Go project, and code written by the developer. By the time Go 1.1 was released in 2013, $GOROOT was removed as a fallback option. A location to store dependencies fetched by go get. Having a per user $GOPATH environment variable also means developers could use the go tool from any directory on their system to build, test and install code, but I suspect only a minority utilise this feature. In my experience, many newcomers to Go are frustrated with the single workspace $GOPATH model. They are confused that $GOPATH doesn’t let them check out the source of a project in a directory of their choice like they are used to with other languages. Additionally, $GOPATH does not let the developer have more than one copy of a project (or its dependencies) checked out at the same time without having to update $GOPATH constantly. I think it is important to recognise that these issues are legitimate points of confusion for many newcomers (including those on the Go team) and act as a drag on Go adoption. As we’re on the cusp of a blessed dependency management tool for Go, I think it’s equally important to continue to question the base assumptions that this new tool will build on, namely requiring a $GOPATH. In my opinion, any Go build tool needs to provide (in addition to actually building and testing code) a way for Go code checked out in an arbitrary location on disk to recover its intended fully qualified import path; the path other code will import it as. The $GOPATH model answers this question by subtracting the prefix of $GOPATH/src from the path to the directory of the current package; the remainder is the package’s fully qualified import path. This is why if you check out a package outside a $GOPATH workspace, the go tool cannot figure out the packages’ fully qualified import path and everything falls apart. What are some alternatives to $GOPATH? I attempted to address both issues with gb, which gives developers the ability to check out a project anywhere you want, but has no solution for libraries, and gb projects were not go gettable. However gb showed that writing a new build tool that did not wrap the go tool meant it was not forced to reorganise the world to fit into the $GOPATH model allowing gb users to include the source of all their dependencies in their project without the pitfalls of the Go 1.6’s vendor/ directory. Recently, on a suggestion from Bill Kennedy, I built an experimental build tool that recorded the expected import prefix in a manifest file. That prefix, rather than one computed by $GOPATH directory arithmetic, is used to determine the fully qualified import path. I’m working on a similar tool (unfinished) based on a suggestion from Brad Fitzpatrick that uses the .git directory as a sentinel to determine the root of the project and hopefully infer the full import path from the git remote configuration. While these experiments are unfinished, both demonstrate that you can avoid the $GOPATH restrictions and retain compatibility with the go get ecosystem. Potentially in the case of Kodos, even avoid a manifest file. Kang and Kodos use a lot of forked code from gb, which I hope to rectify over the new years’ break. If you are interesting in contributing or better yet, building your own Go tool to explore this problem space, Kang, Kodos, and gb are permissively licensed. This is notably different from the way imports work in scripting languages like Python and Ruby, which use directly scanning and inserting onto a global search path source code directories. This entry was posted in Go, Programming, Small ideas and tagged dependency management, gopath on December 20, 2016 by Dave Cheney. What do we want? Version management for Go packages! When do we want it? Yesterday! What does everyone want? We want our Go build tool of choice to fetch the latest stable version when you start using the package in your project. We want them to grab security updates and bug fixes automatically, but not upgrade to a version where the author deleted a method you were using. What versions of this project have been released? What is the latest stable release of this software? If I have version 1.2.3, is there a bugfix or security update that I should apply? The reason for this is Go projects (repositories of Go packages) do not have versions, at least not in the way that our friends in other languages use that word. Go projects do not have versions because there is no formalised release process. Arguing about tools to manage your vendor/ directory, or which markup format a manifest file should be written in is eating the elephant from the wrong end. Before you can argue about the format of a file that records the version of a package, you have to have some way of actually knowing what that version is. A version number has to be sortable, so you can ask, “is there a newer version available than the one you have on disk?” Ideally the version number should give you a clue to how large the jump between versions is, perhaps even give a clue to backwards or forwards compatibility between two versions. SemVer is no one’s favourite, yet one format is everyone’s favourite. I recommend that Go projects adopt SemVer 2.0.0. It’s a sound standard, it is well understood by many, not just Go programmers, and semantic versioning will let people write tools to build a dependency management ecosystem on top of a minimal release process. Of course, if you’re using hg, bzr, or another version control system, please adjust as appropriate. This isn’t just for git or GitHub repos. Imagine if godoc.org could show you the documentation for the version of the package you’re using, not just the latest from HEAD. Now, imagine if godoc.org could not just show you the documentation, but also serve you a tarball or zip file of the source code of that version. Imagine not having to install mercurial just to go get that one dependency that is still on google code (rest in peace), or bitbucket in hg form. Establishing a single release process for Go projects and adopting semantic versioning will let your favourite Go package management or vendoring tool provide you things like a real upgrade command. Instead of letting you figure out which revision to switch to, SemVer gives tool writers the ability to do things like upgrade a dependency to the latest patch release of version 1.2. Tagging releases is pointless if people don’t write tools to consume the information. Just like writing tools that can, at the moment, only record git hashes is pointless. Here’s the deal: If you release your Go projects with the correctly formatted tags, then there are a host of developers who are working dependency management tools for Go packages that want to consume this information. How can I declare which versions of other packages my project depends on? If you’ve read this far you are probably wondering how using tagging releases in your own repository is going to help specify the versions of your Go project’s dependencies. The Go import statement doesn’t contain this version information, all it has is the import path. But whether you’re in the camp that wants to add version information to the import statement, a comment inside the source file, or you would prefer to put that information in a metadata file, everyone needs version information, and that starts with tagging your release of your Go projects. No version information, no tools, and the situation never improves. It’s that simple. This entry was posted in Go, Programming and tagged dependency management on June 24, 2016 by Dave Cheney. Juju is a pretty large project. 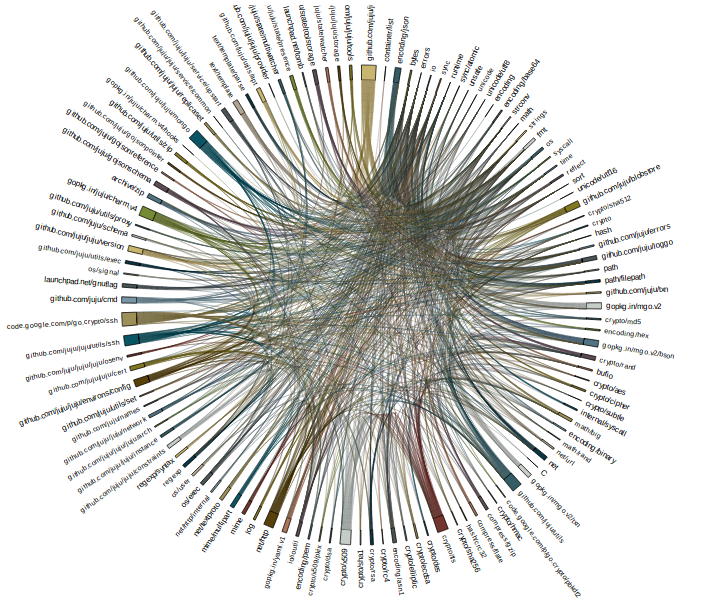 Some of our core packages have large complex dependency graphs and this is undesirable because the packages which import those core packages inherit these dependencies raising the spectre of an inadvertent import loop. Reducing the coupling between our core packages has been a side project for some time for me. 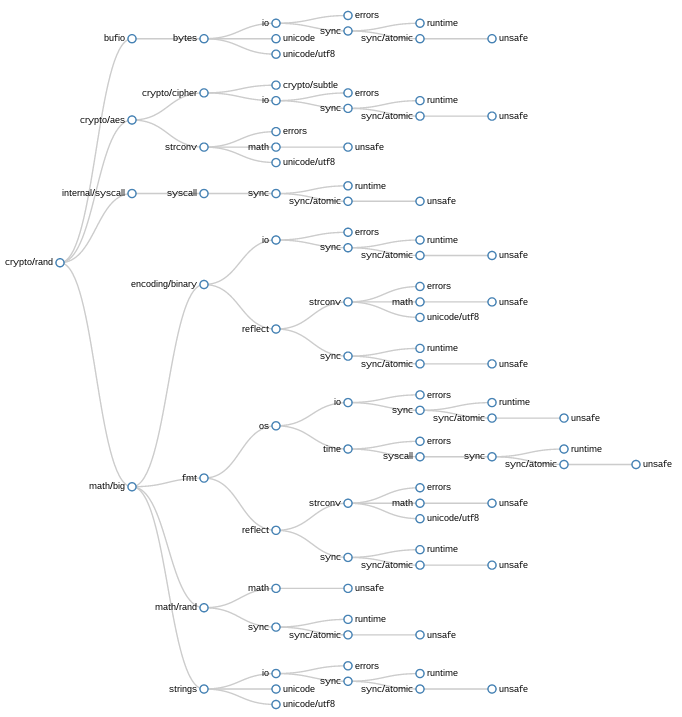 I’ve written several tools to try to help with this, including a recapitulation of the venerable graphviz wrapper. However none of these tools were particularly useful, in fact the graphical tools I wrote became unworkable visually well before their textual counterparts — at least you can grep the output of go list to verify if a package is part of the import set of not. I’d long had a tab in my browser open reminding me to find an excuse to play with d3. 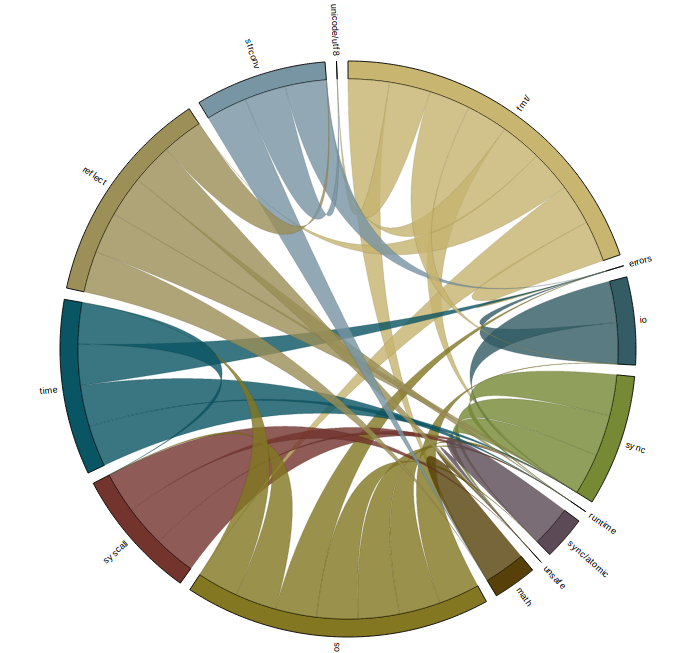 After a few false starts I came up with tool that took a package import path and produced a graph of the imports. In this simple example showing math/rand importing its set of five packages, the problem with my naive approach is readily apparent — unsafe is present three times. This repetition is both correct, each time unsafe is mentioned it is because its parent package directly imports it, and incorrect as unsafe does not appear three times in the final binary. After sharing some samples on twitter, rf and Russ Cox suggested that if an import was mentioned at several levels of the tree it could be pushed down to the lowest limb without significant loss of information. This is what the same graph looks like with a simple attempt to implement this push down logic. This approach, or at least my implementation of it, was successful in removing some duplication. 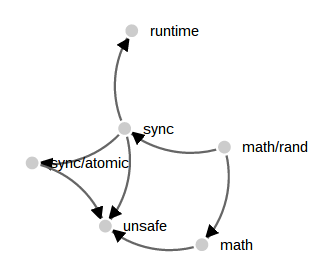 You can see that the import of unsafe by sync has been pruned as sync imports sync/atomic which in turn imports unsafe. However, there remains the second occurrence of unsafe rooted in an unrelated part of the tree which has not been eliminated. Still, it was better than the original method, so I kept it and moved on to graphing more complex trees. In this example, crypto/rand, though the pushdown transformation has been applied, the number of duplicated imports is overwhelming. 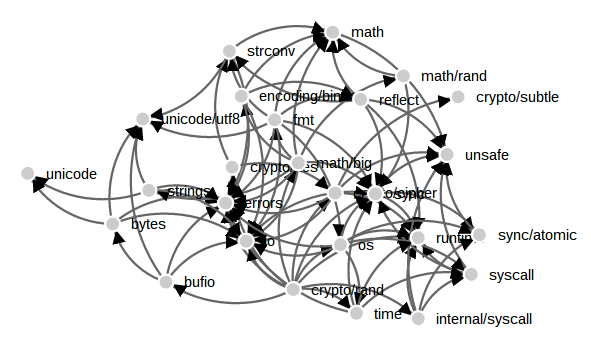 What I realised looking at this graph was even though pushdown was pruning single limbs, there are entire forks of the import graph repeated many times. The clusters starting at sync, or io are heavily duplicated. While it might be possible to enhance pushdown to prune duplicated branches of imports, I decided to abandon this method because this aggressive pruning would ultimately reduce the import grpah to a trunk with individual imports jutting out as singular limbs. While an interested idea, I felt that it would obscure the information I needed to unclutter the Juju dependency hierarchy. Although I had known intuitively that the set of imports of a package are not strictly a tree, it wasn’t clear to me until I started to visualise them what this meant. In practice, the set of imports of a package will fan out, then converge onto a small set of root packages in the standard library. A tree was the wrong method for visualising this. Comparing this to the tree examples above the force graph has dealt with the convergence on the unsafe package well. All three imports paths are faithfully represented without pruning. But, when applied to larger examples, the results are less informative. I’m pretty sure that part of the issue with this visualisation is my lack of ability with d3. 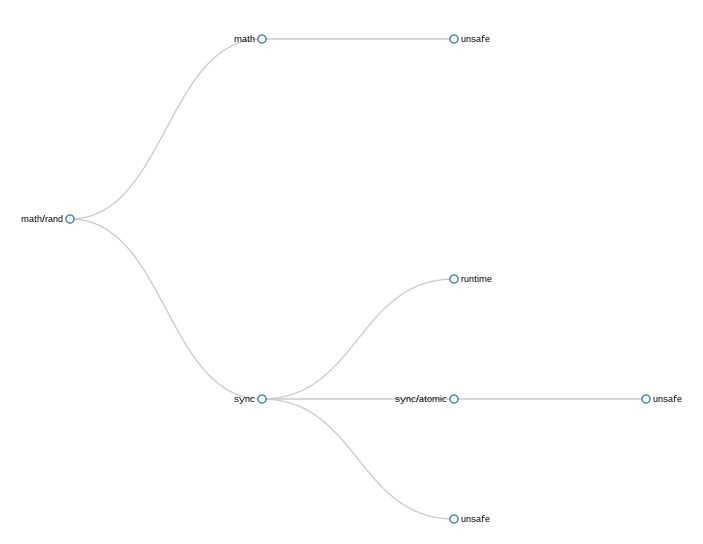 With that said, after playing with this approach for a while it was clear to me that the force graph is not the right tool for complex import graphs. Compared to this example, applying force graph techniques to Go import graphs is unsuccessful because the heavily connected core packages gravitate towards the center of the graph, rather than the edge. The third type I investigated is called a chord graph, or at least that is what it is called in the d3 examples. 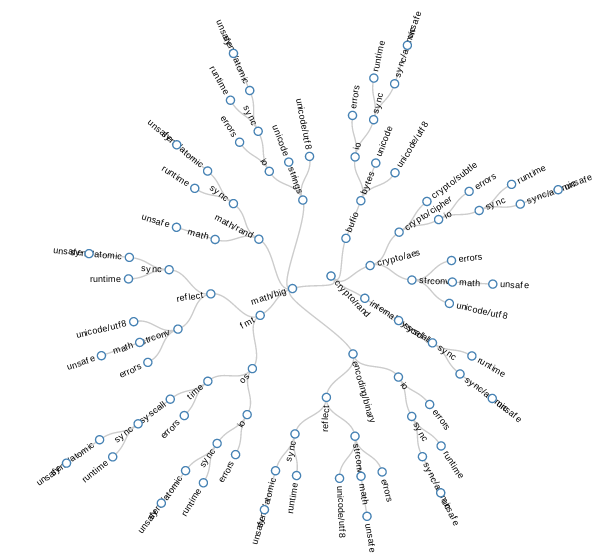 The chord graph focuses on the interrelationship between nodes, rather than the node itself, and has proved to be best, or at least most appealing way, of visualising dependencies so far. While initially overwhelming, the chord graph is aided by d3’s ability to disable rendering of part of the graph as you mouse over them. In addition the edges have tool tips for each limb. In this image i’ve highlighted bufio. 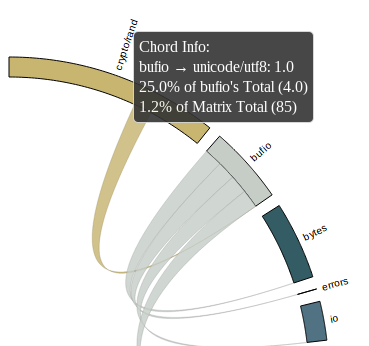 All the packages that bufio imports directly are indicated by lines of the same color leading away from bufio. Likewise the packages that import bufio directly are highlighted, in different color and in a different direction, in this example there is only one, crypto/rand itself. The size of the segments around the circumference of the circle is somewhat arbitrary, indicating the number of packages that each directly import. For some packages in the standard library, their import graph is small enough to be interpreted directly. Here is an shot of fmt which shows all the packages that are needed to provide fmt.Println("Hello world!"). 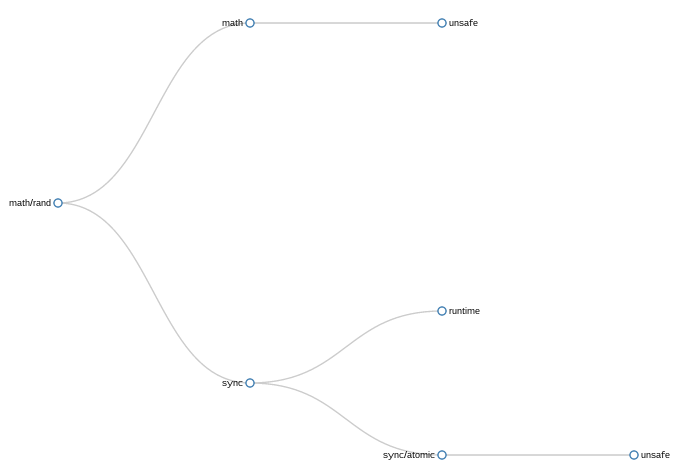 This is a graph of the code that I spend most of my time in, the data model of Juju. I’m hesitant to say that chord graphs work at this size, although it is more successful than the tree or force graph attempts. If you are patient, and have a large enough screen, you can use the chord graph method to trace from any package on the circumference to discover how it relates to the package at the root of the graph. What did I discover ? I think I’ve made some pretty pictures, but it’s not clear that chord graphs can replace the shell scripts I’ve been using up until this point. As I am neither a graph theorist, nor a visual designer, this isn’t much of a surprise to me. The code is available in the usual place, but at this stage I don’t intend to release or support it; caveat emptor. Alan Donovan’s work writing tools for semantic analysis of Go programs is fascinating and it would be interesting to graph the use of symbols from one package by another, or the call flow between packages. 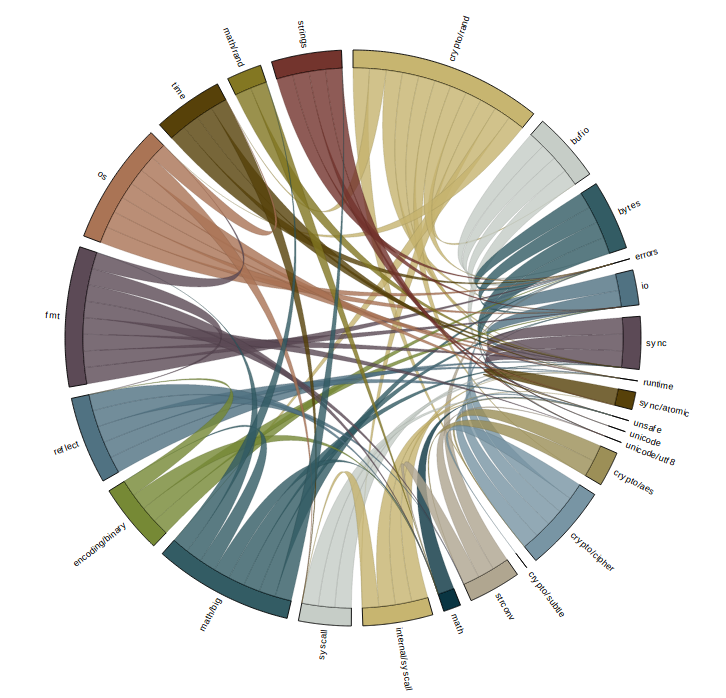 This entry was posted in Go, Programming and tagged dependency management, visualisation on November 21, 2014 by Dave Cheney.